Zele International has started to take orders for their complete cars. The cars are going to be starting to be delivered March 30, 2009. Priced at 207,434 US Dollars , they are definitely out of the price range of most people. I wonder how many they will actually sell in this economy. Probably not that many. 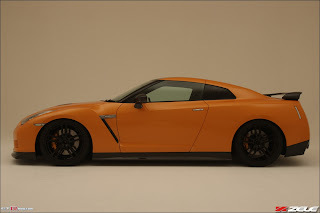 Following the launch of the new generation supercar, the Nissan GT-R, at Tokyo Motor Show in October 2007, Zele International Limited has used its experience and knowledge from research and development on the road and track, to create the ultimate production car. To optimize the power-to-weight ratio, power delivery and handling, Zele International modified the GT-R’s engine, engine management system, suspension and aerodynamics. ZELE R35 GT-R Complete Edition’s brain, the “FZ-ROM Type 3 ECU” increases engine power output to 550ps. Titanium is used extensively in the exhaust system, and offers the benefits of weight saving, heat proofing and an exciting exhaust note. Oil temperature management is also important to optimize the performance and as such, a rear differential oil cooler is fitted. All of these modifications have improved the standard GT-R’s weak points and thus enhance the overall performance. 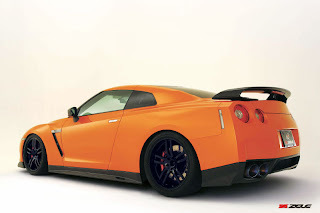 In order to optimize the GT-R’s power-to-weight ratio, Zele International Limited makes extensive use of carbon fiber. 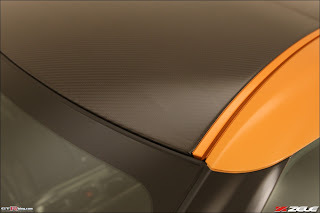 Dry carbon fiber is used for the roof, the front bumper, the rear spoiler and the side rear view mirrors. Further to this carbon fiber is used for front lip spoiler, side skirts, NACA hood air ducts, rear under spoiler and so on. To optimize the handling for the ZELE R35 GT-R Complete Edition, Zele International Limited developed a height adjustable (HA) Conversion Kit that gives added features to the GT-R’s standard Bilstein shock absorbers. Using the Zele HA Conversion Kit, it’s possible to adjust the vehicle ride height as desired while retaining the standard Bilstein Damptronic System electronically adjustable damper functionality. To enhance the GT-R’s considerable stopping power, Zele Sports Brake Pads are fitted to the standard Brembo aluminum brake calipers. The wheels on ZELE R35 GT-R Complete Edition are Zele original RAYS 20 inch forged alloy wheels. Customers are given the choice of either GramLights R57GT or the new Volk Racing TE37 G2. Holding you in place during high “G” cornering are a pair of Alcantara trimmed RECARO full bucket seats. ZELE R35 GT-R Complete Edition offers an outstanding look with ZELE’s award-winning premium bodykit and Customized Paint Program which can be ordered in any color you choose. At the SEMA Show 2008 in Las Vegas, U.S.A., ZELE R35 GT-R Complete Edition Proto was ranked as one of the top 13 cars by Mothers taking away the Mothers Choice trophy for design excellence. *3 Rear Differential Oil Cooler available only when Titanium Muffler Type1 is ordered. *4 The kit converts the standard Bilstein shock absorber to height adjustable suspension. The brain for the ZELE R35 GT-R Complete Edition manages a significant maximum output increase to 550ps. The dry carbon fiber roof is as strong as a steel roof, yet weighs far less. It reduces weight from the highest point of the vehicle, lowering the center of gravity and reducing yaw during cornering. The original steel roof is replaced with the dry carbon fiber one using the same adhesive used for SUPER GT race cars. Using dry carbon fiber reduces the weight above the trunk lid significantly. The shape is optimized to produce more downforce with the Zele full bodykit. It allows ideal power delivery with less drag. Using dry carbon fiber as the material, it reduces the overhang weight significantly. Weight reduction in this area provides better cornering. The design is the same as the standard award-winning Zele Front Aero Bumper. In ZELE R35 GT-R Complete Edition, there are no compromises. Customers with a particular color in mind will find Zele International Limited can mix the exact water-based metallic or pearl-effect shade desired. 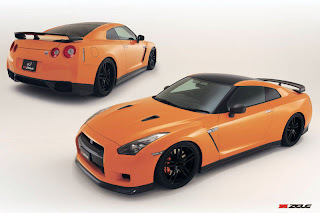 The ZELE R35 GT-R Complete Edition is covered by Zele Performance Worldwide Warranty. The Zele Performance Worldwide Warranty is a one year or 20,000km limited warranty with conditions based on the Nissan High Performance Center’s general warranty conditions. * Net price. Total price varies with the base car and options order. On sale: 30th March 2009. Delivery: Estimated lead time is around 90 to 180 days, and may vary depending on availability of the base car. Limited production of eight units. Zele International started as an independent Nissan Skyline specialized dealer in the Kanagawa prefecture in the year 2000. Since 2000, we have supported GT-R enthusiast owners, and have proudly earned a very good reputation among GT-R owners. Many overseas customers have purchased Nissan GT-Rs from us, even though they may not have seen the car in person. Our great reputation in Japan has influenced our overseas customers as well. 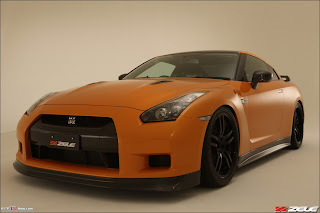 When the Nissan GT-R supercar debuted, we began producing performance parts for the car. Our passion and specialized skills helped us to distribute quality products to GT-R enthusiasts all over the world.